Do you think that you have the mental and physical strength to go to the far corners of the earth to find some treasures? 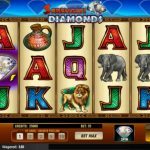 Well, now you can test your skills and preparedness in the latest addition to Lightning Box portfolio, Serengeti Diamonds video slot game. Behind the reels you can see the top of mountain Kilimanjaro and the sound effects perfectly match the theme. What makes Serengeti Diamonds so special is the fact that there is only one bonus game, but it can last really long. And we all know what that means, more chances to land big wins. But first let’s see what special symbols we have here. The wild symbol will stand in for every other symbol to complete a winning line and the scatter, which is the huge diamond, is the key to the main feature. So, to activate the Diamond Pick Bonus you need to land 2, 3 or 4 scatter symbols on adjacent reels. The reels with the diamonds on will freeze and you will receive free spins so you can land more diamonds. With every next diamond you get you will receive 3 more spins. 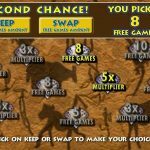 If you manage to land all diamonds, you will have to pick 2 to reveal the number of free spins and a multiplier. 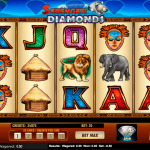 Serengeti Diamonds is quite an old game from Lightning Box but it is still popular among players. The reason for that is because this game offers a nice and long feature. After all, this is where you can win some huge amounts and improve your balance. The betting options are wide, so that is another plus for the game. So, every kind of a player can find the right bet size for them.